For many years now, even before the discovery of antibiotics, microorganisms such as bacteria and viruses have managed to develop resistance through various defence or escape mechanisms. Nowadays one of the biggest issues in modern day medicine is the rise of antimicrobial resistance (AMR). The worst part of all of this? It is mostly our fault. Most laypeople and health professionals as well think that when someone presents with some signs and symptoms caused by a microorganism (e.g. a bacterium), giving an antimicrobial drug will be the best solution. Unfortunately, it is not that easy. In 2008, only 15 of all 167 antibiotics under development had a new mechanism of action. Developing antibiotics with a new mechanism of action is imperative, because the previously resistant bacteria are unlikely to be resistant these new drugs as well.The failure to produce new, effective and affordable antibiotics highlights the inadequacy of the current profit-driven research and development (R&D) system. Just to give an example, 480.000 people develop multi-drug resistant tuberculosis every year and only 2 new drugs have been developed in the last 50 years. Despite the prediction by a UK group led by economist Lord Jim O’Neill of a post-antibiotic era where drug resistance could kill 10 million people annually by 2050, very little is being done about it. Therefore, an evidence-based and needs-driven R&D system established through a global agreement is needed. 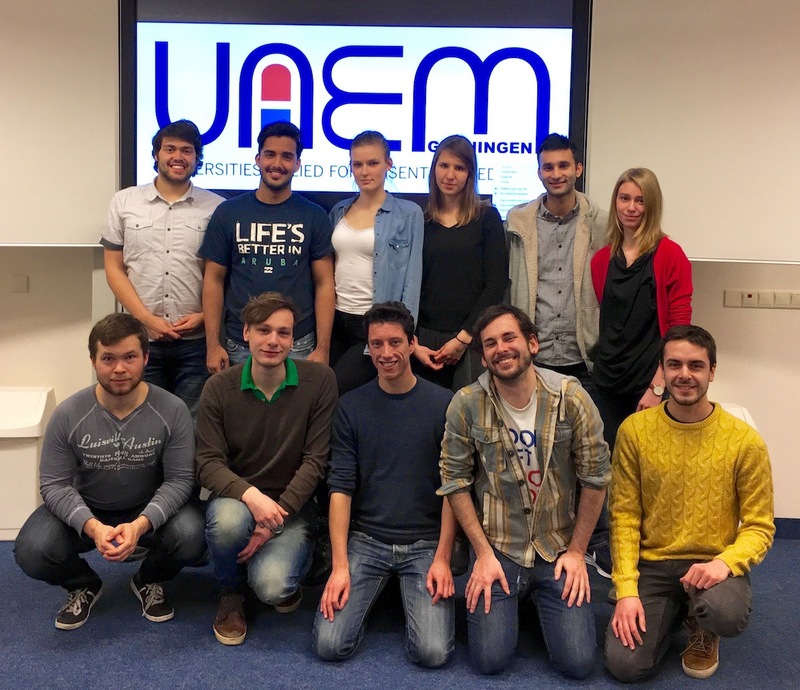 We, members of the Universities Allied for Essential Medicines (UAEM) in Groningen, strive to achieve this goal. UAEM is a global network of students who recognise the need for the improvement of global access to public health goods and the need to use those goods responsibly. In other words, we work towards making medicines more affordable, accessible and adequate for all. In addition, we also strive for awareness of other students and the public to recognise that the focus of medical research should be aligned with global needs rather than commercial gains. For instance, why is the funding for diabetes research more than 15 times the amount of that for malaria and more than 100 times that of other parasitic infections? Why is it that only 0,4% of the funding is dedicated to tropical diseases, which affect 16% of the global population? Why is it that middle and low income countries are faced with inadequate access to vaccines, resulting in more than 2 million deaths each year? These are just a few examples of what UAEM sees as social injustice, often leading to neglect of the world’s poorest people. UAEM’s history goes back to 2001, when a group of Yale University law students together with Médecins Sans Frontières convinced Yale and the pharmaceutical company Bristol-Myers Squibb to permit generic production of a discovered HIV/AIDS drug in sub-Saharan Africa. This triggered a dramatic 30-fold price reduction of this drug and made the treatment more accessible to affected people and ensured their survival, millions of people were saved this way. This showed that because universities greatly contribute to drug development, they are able to influence the way medical technologies are developed and distributed. They have the power to help alleviate the access to medicines crisis. Nowadays, there are more than 100 chapters at universities in 18 countries worldwide with one common aim: to allow everyone to benefit from university research into life-saving drugs. Among the many activities organised by UAEM, there is one that deserves a special mention: the Access to Medicines Week (A2MW). Every year, each chapter in the world commits to organise several events within one week dedicated to raising awareness about a particular topic: this time it was all about AMR. UAEM Groningen also wanted to make its contribution and therefore organised various events during its A2MW week (14-20.11.2016). We thought it was important for all participants to have a solid background and thus started the week with a roundtable discussion, during which we had the honor of having Miss Ellen ‘t Hoen (former director of Policy and Advocacy at Médecins sans Frontières), Prof. dr. Maarten Postma (director of GUIDE and WHO advisor) and Ms. S. Nepal (PhD student, Microbiology, UMCG) conduct the discussion. As many also learn by doing, we decided to have our own Dr. House inspired activity, where anyone could have the chance to solve an intriguing medical case. Last but not least, given the fact that most of the audience was made up by students, we also tried raising awareness through fun activities such as a Pub quiz at De Toeter and a themed party at Het Pakhuis. Interview with Ellen ‘t Hoen: her thoughts and concerns on the growing problem that is AMR, and what we can do to help. Ellen ’t Hoen is a lawyer and an independent consultant in Medicines Policy & Law with expertise in the area of access to medicines. From 1999-2009 she was the Director of Policy and Advocacy at MSF Campaign for Access to Essential Medicines. Early 2016 she joined the Global Health Unit of the University Medical Centre Groningen where she does research on intellectual property and medicines law and policies. She is also a member of the WHO Expert Advisory Panel on Drug Policies and Management and the Advisory Board of UAEM. In 2005, 2006, 2010 and 2011 she was listed as one of the 50 most influential people in intellectual property by the journal Managing Intellectual Property. By December 2050 it’s expected that 10 million people will die annually due to resistant infections. How much of a growing concern is this in first and developing world? AMR is globally recognized as an important crisis, Ellen says. ‘This is not new, we’ve known for decades that this was coming. This is something that requires an international response, there’s no country that can deal with this single-handedly. Ellen strongly believes action is necessary to stem further abuse and overuse of antibiotics, to stem further development resistance. It is also necessary to act to make sure that new classes of AB are developed. Only 2% of research and development is spent on NTDs (neglected tropical diseases), which is a worrying fact. Ellen elaborates on this: ‘the problem is that we as a society trusted the development of new medicines to the commercial sector. What was overlooked by doing that is the fact that the commercial sector does not invest in medicines they do not consider profitable. NTD is an example of such a group that will be left without treatment. Drug companies are clear in their stance, they won’t make the same kind of amount of money investing in drugs against NTD’s that they do with blockbuster drugs, so they will not invest in them. There actually is a market for NTD (there are many people with NTD’s), the problem is that this is a market with no purchasing power. We, the people, collectively finance the pharmaceutical sphere, a lot of money is going around here. Even if small amounts of money would be invested in a different way, e.g. to pay for R&D focused on NTD’s, there would be sufficient money for this field. Subsequently the products that come out of this can be sold at a very low market price or be preserved for when there is a serious infectious outbreak. In this way you solve both the pricing (access to essential medicine) problem and the need for new antimicrobial drugs because of AMR. This article was written by members of UAEM Groningen, and was published before in PanEssay, the magazine of Panacea (medical study association in Groningen). It was republished here with permission. What does it mean to be neglected?